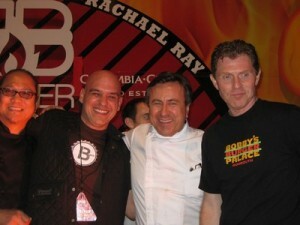 MIAMI SOCIALHOLIC » Blog Archive » South Beach Wine & Food Fest: So Much Fun! 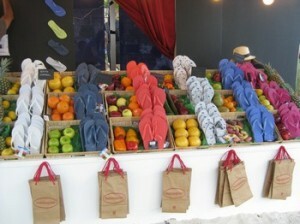 South Beach Wine & Food Fest: So Much Fun! The ninth annual Food Network South Beach Wine & Food Festival has come and gone, leaving the South Beach sand wine soaked, the air tinged with delicious aromas and our scales tilting in the wrong direction. This year’s festival boasted an unprecedented number of events, with more than 50, 000 attendees, and over $2 million raised for the Florida International University (FIU) School of Hospitality and Tourism Management and the Southern Wine & Spirits Beverage Management Center. The Amstel Light Burger Bash kicked -off the four day festival on Thursday night. Bobby Flay, Daniel Boulud, Guy Fieri, Rachael Ray, and Michael Symon all under one tent is any foodies dream, and this year’s carnivorous romp made that delectable dream come true as chefs from all around our nation battled it out to see who could come up with this year’s People’s Choice Award for “Best Burger.” The party, held in a giant tent behind the Ritz Carlton, was a blast, the cool weather adding to the already high-spirits of SBWFF lovers, who didn’t seem to mind the smoke and barbecue “fragrance” which permeated their lungs, hair and clothing. 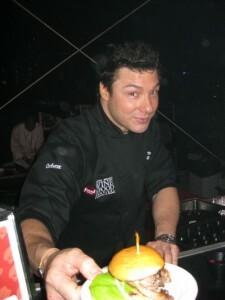 Last Year’s defending champ, Spike Mendelsohn, wore a heavyweight championship belt, boxing trunks, robe and gloves and had the Rocky theme song blaring from his section, while serving his classic burger with American cheese and bacon on a soft bun accompanied with a cotton candy milk shake (yummy!). Masaharu Morimoto’s burgers were rumored to be among the best, as evidenced by the line of people waiting that spanned the length of the tent. The Iron Chef won for best “toppings” and was awarded a Tiffany Heinz Ketchup Bottle. The 2010 People’s Choice Award winner was Michael Symon of B Spot and his Swiss, pastrami, and coleslaw burger (Pepcid, anyone?). Former champ, Mendelsohn graciously handed over his heavyweight belt to Symon to solidify the win. Our very own, Michael Schwartz of Michael’s Genuine Food (who in our humble opinion makes the best burger in Miami) took top honors earning the Allen Brothers Golden Grill Award – the judge’s choice for best burger for his bacon cheeseburger on brioche with a side of crispy hominy with chili and lime. Other celeb-chefs spotted included Sandra Lee, Michael Chiarello, Sunny Anderson, Rocco DiSpirito, Jeff McInnis, Govind Armstrong, Tim Love, Carla Hall, Art Smith, Anne Burell, and Michael Schwartz among many others. The delightful dessert selections from Jeni’s Splendid Gourmet Ice Creams (almond brittle and Cocoa Zin and salty caramel-ooh la la!) and Levain Bakery’s 6 oz cookies (yes, almost half a pound) capped off a perfect evening. A portion of the Burger Bash proceeds went towards Rachael Ray’s nonprofit Yum-o!® Foundation. Friday night, the Perrier-Jouët Bubble Q, traditionally the most gout-worthy event during SBWFF, and our idea of the “true” South Beach Diet: limitless, perfectly seared meats and seafood paired with free-flowing PerrierJouët. Now there’s a diet we can stick to! Host Emeril Lagasse was the “King” of this parade, with his scrumptious Creole pulled pork sandwich simply wrapped in foil, the best pulled pork sandwiches this side of…well, anywhere pleasing his fans with his bustling personality. Norman Van Aken’s fried Cuban picadillo stuffed sandwich called a “mollete” was another hit, (wishing we had that at 2 a.m). 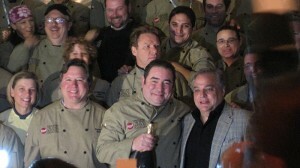 But the best part of all was watching (and participating with) chefs and the F.I.U. students letting it all hang out as they partied to great music enjoying the incredible weather. This year’s Bubble Q, heavier on the bubbles than the “q” was noticeably more subdued than last year’s, when the tent turned into a gigantic ball pool, (like the ones you see at Chuck E. Cheese) wherein the revelers (who had been magically transformed into a bunch of second graders under the spell of Perrier Jouët) joined the chefs and FIU sous chefs, in recklessly hurling the plastic balls that were intended to resemble champagne bubbles, to the chagrin of the DJ, who feared for his equipment. Needless to say, the ping pong balls were verboten this year, replaced by less hazardous props: a really cool photo booth and our favorite chandelier girl, suspended from the rafters, dressed in lime green, pouring glasses of bubbly. We continuously ask, “What was her major in college?” Chefs in attendance included: The Neelys, Aaron Sanchez, Michelle Bernstein, Chris Lilly, Tim Love, Steve Martorano, Todd English, Guy Fieri, Elizabeth Karmel, John Besh, Cindy Hutson, Jennifer Behar, Howie Kleinberg, Gordon Maybury, Adam Perry Lang, Susan Spicer, Norman Van Aken, Allen Susser, just to name a few. Pennsylvania-based Sweet Street Desserts created a dessert bar complete with ice sculptures and hunky “dessert boy” (www.sweetstreet.com) and Godiva provided chocolate decadence. Proving once again, that (wo)man can live on champagne and chocolate alone. What the Burger Bash was to burger lovers, Sunday’s Joe’s Big Chill at Joe’s Stone Crab was to claw fanatics. The packed restaurant served guests family-style, with unlimited stone crab claws, signature sides and champagne. Talk about the stuff of fantasy. Fellow stone crab lovers mused that this should be America’s new Thanksgiving menu. It’s got our vote for sure! On Sunday night, stylish flip-flop brand, Havaianas, teamed up with celebrity chef Guy Fieri to host the Moon Over Miami SBWFF closing night party at the Gansevoort South. A perfect union of food, fashion, tequila and beach festivities, with Food Network stars, celebrity chefs and VIPs including Guy Fieri, Anne Burrell, Fabio Viviani, Robert Irvine, Sunny Anderson, Marc Summers, Lee Schrager, Maria Russo and many others partying and visiting the Havainas Mercado to trade their shoes and Crocs for Havaianas, more suitable for dancing in the sand.